All of our puppies have found their forever homes! Imladris Shilohs and DreamCatcher Shilohs are pleased to announce the pairing of Nottingham’s Laerwen O’Imladris (Lyra) to Dreamcatcher’s Shadow Prancer (Caesar). This combination brings together a touch of outcross (Artus and Orbit) and old line Shiloh from Lyra and foundation and old line Shiloh from Caesar. Pups will be 6.25% outcross. 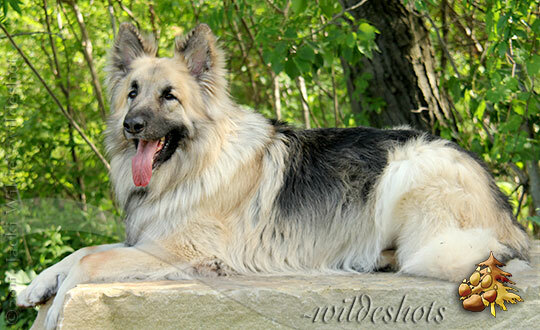 We are expecting pups with substantial bone, blocky heads, and good overall size with stable, loving temperaments. These pups will be plush coated, mostly sables with a chance for a few duals. 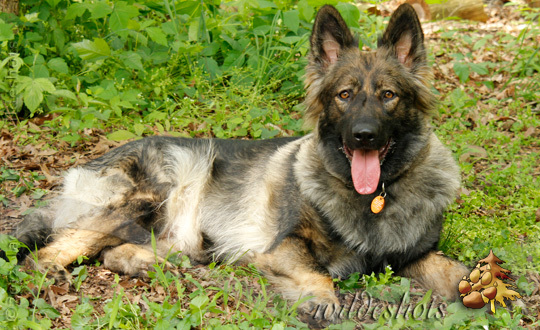 Lyra is a solid girl with a medium soft temperament. 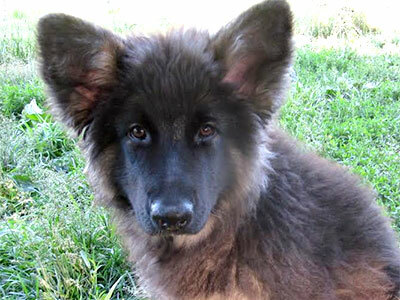 She has a wide body and blocky head with well-set ears of medium size. Her coat is very thick and she has a lovely saber tail. Lyra is ever alert to her surroundings and the first to warn of strangers. She maintains her alert status until told to stand down, at which point she is cautiously accepting of the newcomer. With her family she is very loving and wants very much to please. Caesar is a black & cream dual with a magnificent head, great bone, beautiful movement and a medium-soft temperament that always draws a crowd. He absolutely adores children, his sweet, gentle & patient personality winning over even the few leery of this 'Gentle Giant' who is truly a big teddy bear and the ultimate companion. He weighs in around 110, was wicketed at 29 1/2 inches and passed all his health testing . Caesar is a calm, easy going boy. His nick name, "Prancer' came about at an early age when he confidently pranced around the show ring like his Great Grandfather Apollo & Father Saber. He continued to excel in the ring, earning his Breed Championship & his NAKC Championship along with his CGC & TT.